We don’t like change and we fear the unknown. New things don’t stand a chance! 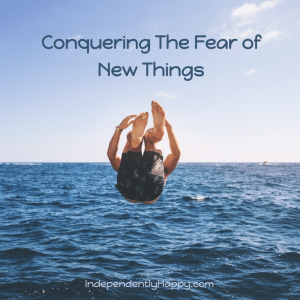 This how to beat neophobia, how to conquer your fear of new things. Cool image by Austin Neill at unsplash.com! I love phobias. It fascinates me the fears of things for which we have words. What’s the word for a fear of awkward sentences? Neophobia is not the fear of The Matrix. Neophobia is the fear of new things. 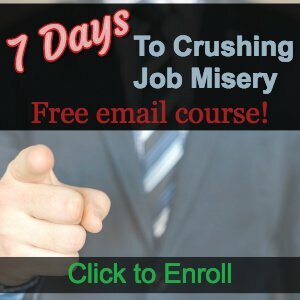 It could be the fear of trying a new item on your favorite restaurant’s menu, or perhaps the fear new policies at work. This site lists these symptoms, so it’s obviously a legit phenomenon. Those are all terrible experiences. I avoid most of those when I can. It is better to risk facing those symptoms on your own terms than when surprises present themselves. We can’t control everything that happens, though. We can only control our responses. Usually. That’s why I like to practice by frequently exposing myself to new things. That, opposed to simply frequently exposing myself. That would be sick. Try new things to spice up your life and gain new experiences. Try new things simply to get used to trying new things and conquer the fear of new things. Try new things to inspire others to try new things! That third reason I learned from this Medium story Why risking embarrassment is actually a win-win for you. Jordin Kelly recounts the story of watching a woman try paddle boarding during her beach vacation. Watching this brave woman’s extremely difficult (and hilarious) time in learning this new skill and finally succeeding inspired Jordin Kelly to try paddle boarding herself! How do you conquer the fear of cold water? You dip in a toe. Unless you fear losing your balance, then maybe you kneel down and feel the water with your hand. Uncertainty is removed from the cold water scenario. We know if we jump in, it takes just a few seconds to adjust to the cold water temperature, but it’s a big shock. So we tiptoe in and extend the suffering, small amounts of suffering over a longer time. I’m a dunker. I considered “To Dive or to Dip”, but I fear actual diving. I’ll either hit the bottom or worse: I’ll get water up my nose. Go For the Quick Dunk! Whether it’s a swimming pool or the ocean, I go for the quick dunk. I also frequently do the cold shower thing in the mornings, so I’m a little more used to it. It didn’t start that way though. I stared at the faucet, dreading the tiny daggers of cold water I knew would pierce my skin. Could my heart take the shock of that icy cold water? Cool image by Vincent Guth on unsplash.com! Surely I’d be thrown into cardiac arrest. I used to be on blood pressure meds, you know. Then I reached out, though, but using my left hand and freeing my right hand in case I needed to push the door open and make a quick escape. Next step, reach out and turned the faucet to cut off that glorious warm water. I also did this in the summer, so I know I’m not helping much by posting this in October. What was I supposed to do, posts about fear before St. Patrick’s Day? Articles about fear are better posted during Halloween’s month. One-quarter turn, then brace for torture. Okay. Not so bad yet. Another quarter turn and brace for impact. Right hand now. Full turn. That did it! Then I surprised myself by leaning into the cold. Cold water on your legs or stomach is one thing. Step in and let it hit your chest. Turn around and give it your shoulders. Tilt your head back for the full effect. It wasn’t that bad. It actually felt good enough to repeat over the next few days. Did you just tell a story about a shower? Yes, I did! Cold showers and spicy food are easy new things. You can easily get out of the shower, turn the water back to warm or ask the wait staff for a different dish. Careful mixing these scenarios. Improv class or piano lessons might seem scary, but less scary than bungy jumping or being confronted by strange people in places you’ve never been. Every little bit helps though. We can very rarely exercise much control over what happens. We also can’t control fear. Why not make fear fun? Here are a few things to try to make fear fun, plus a ghost story! Before Taekwondo one night, some of the kids saw a spider on the floor. I dislike spiders just as much as any normal person should, but I was not going to display fear to the kids or the lower belts. I was a red belt! I walked over to the corner were Aragog was watching the class. I looked at it. Not nearly as cute as the one in this picture. Then I looked around to make sure nobody was watching. So I reached down and picked up the spider with my bare hands, walked to the door calmly (on the outside) and let the spider go outside. Aragog did not bite me and inject me with deadly venom. 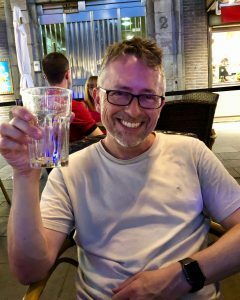 I lived to blog the tale. The kids and the ladies all thought I was pretty cool. Find little things you fear, but that you can handle, and start dipping your toe into scary things. Make fear fun, so that when it’s not fun it will at least be a little less scary. You’ll have a little better control over those symptoms. What are some new things you might fear? Not big things like hurricanes and dictators. Little things like roller coasters, spiders, food that might taste really weird, or people with different religions? 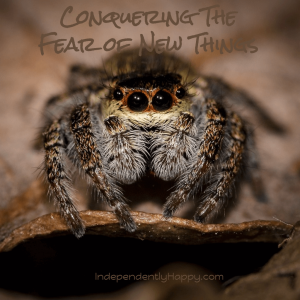 Please share some simple actions you take to conquer the fear of new things.